The Monsookan (Wild Man) of Lake Helen pre-dating 1887 is referenced in an article in the historical archive in the township of Red Rock. I will add some commentary on this as well. In the early days, a man came to the area under the HBC. ~ The Hudson's Bay Company had routinely traded fur and goods in the area since 1792. The Northwest Company had already established a post at the mouth of the Nipigon river in 1785, for both of which, trading was quite dangerous with the warring companies competing in the lucrative fur trade. In 1821 The Northwest Company and The Hudson's Bay Company finally joined together, and thus HBC slated their name over the only operating post. Natives traded furs with them for essentials making life in the rugged Northwest easier, but HBC also sent their members through to remote places for trading as well. While coming across the company of the local natives ~ While looking into the history of the Red Rock/ Lake Helen Indian Band, they put a surveyor out to survey the land on the Eastern side of the lake in 1886 AL Russell, the location is what I believe to be the exact spot where the present day reservation is. In speaking of the first location - This reservation is on the West bank of the Nipigon River near it's inlet to Lake Helen, where Chief Pierre Deschamps and other civilized Indians have made comfortable homes and well cultivated gardens - Thunder Bay District 1821 - 1892. The place they are speaking of is Parmachene. A site the band still uses to this day, which is good for hunting, camping, trapping, gathering, berry picking, and traditional ceremonies, as well as good fishing in the river. They story of sending a surveyor out survey new land seems to be the one to go with, however the HBC archive reference is quite astounding, and may be the reason they wanted a surveyor in the first place. Prior to living in Parmachene, they groups seems to have lived and settled in Lake Nipigon West and South, and progressively moved toward the mouth of the Nipigon River. they told him the whole settlement was forced to the Eastern shore, ~ This story seems to be in retrospect, and the HBC man found them at the present location after 1887. It seems to me that he began questioning them as to their history and the story came out. The Eastern shore would place the population on the St. Sylvester's Church side (built in 1877) which is the present location of the Reservation. Locals had seen this creature and were being terrorized. ~ Whether out hunting or trapping, those unfortunate enough to have an encounter came back with stories of terror, going from being watched, and followed to having face to face encounters with the being. Not only was it deep in the woods, it was now just beyond their settlement in the tree line, causing locals all manner of grief. It seems a native girl was taken from their group one night and could not be located. ~ The creature grew more bold and actually took a girl from their group. Upon noticing a family member was missing, the settlement was given notice, but no one could find her as night had fallen on another dreadful night of sleeplessness at Parmachene. The next day a party was sent into the deep woods, ~ At dawn a search and rescue party was sent out to locate her, most likely armed for fear of the terrible beast whatever it may be. she was found running in terror and mad, clothing ripped, scratched by branches and full of mosquito bites. 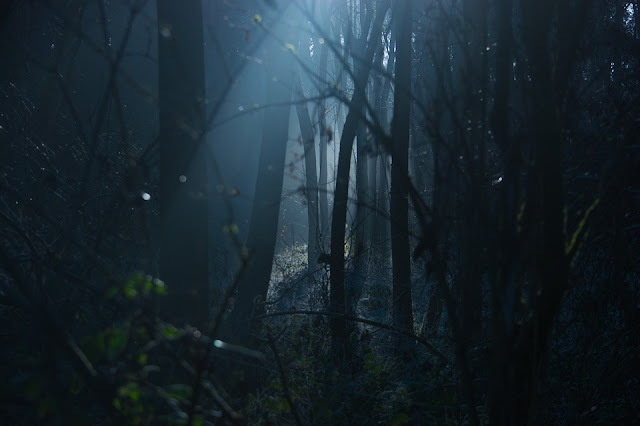 ~ It seems she ran right across the path of the search and rescue party, almost completely driven to the edge of insanity by the terrifying ordeal, and the clouds of mosquitoes we have up here in the Northwest woods. She may have developed a panic often called going bush crazy, and running through the woods in such panic will definitely rip through clothes. She was very lucky to come across the group or she would have died, even if the creature didn't kill her. She was carried off and held captive by a monstrous being, and given a chance to escape she took it. ~ The night prior it crept up on the unsuspecting girl, (alone) and took her. How did the villagers not hear her screams? Unless it knew enough to hold it's hand over her mouth. It carried her a long distance into the forest, as it is stated that the group was sent into the deep woods. When it reached it's home or a suitable location to hold her for the night, it watched her and every movement to get away back home was guarded. The chance to escape must have been a momentary lapse in guard, by the creature growing too comfortable with her there, and falling asleep, or turning away momentarily. Whatever happened, it did not chase her, as there is no mention of the party coming across the beast. This creature had terrorized the villagers long enough that it was even given a name. They told him to beware as the "Monsookan" was in the area. It was described as a wild man bent on kidnapping and murder. ~ When asking, I did not relay this story yet, I found the name "Monsookan" Pronounced Mah-zoh-kay(n) to be like knocking on someone's door and running away, or stepping out from something and disappearing again. Then I relayed the story as this all made sense to me. It is clear that since the first audible encounters with the beast, the group settlement did not just up and leave, but stayed and dealt with the ever increasing problem, that was growing harder and harder to ignore. The HBC man must have asked what a Monsookan was, and was told it was not a beast, but only what they can describe as a wild man, whose only concern was taking from them and killing them one by one. He was given warning that even at the new settlement (present location) on the Eastern shore, he was still in the midst of the creature's territory. Every night it screamed wildly and threw rocks at their dwellings. ~ The creature over time becoming bolder and bolder went from not just watching, but to vocalizing it's presence and scaring the group by screaming, and eventually throwing rocks at their homes. Tension was ratcheting up, and something bad was coming. Men, women, children, afraid to sleep, afraid to stay awake, knew this Monsookan was going to get them. There was no way to stop it. It had killed one of the villagers and the lot was forced to leave. ~ At the height of the Monsookan's reign of terror over the village, there had to be a blood curdling scene witnessed by the group. One of them was killed by the wild man, and they were faced with a forced decision to keep their number alive. To get on that river, cross the lake to the other side before they were all killed. 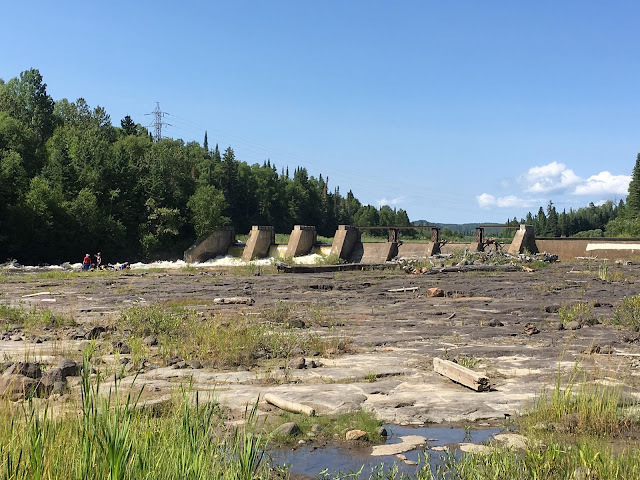 They took to canoe and paddled each family across the treacherous waters of the Nipigon River to safety. ~ To me, knowing the location it sounds like days of back and forth following the Nipigon river onto Lake Helen, to where it narrows at the pincers of the Nipigon river and dropping off family after family. They were safe... As far as they knew at the time, they were safe. By the tie they told they story to the HBC man, they knew they were still in the Monsookan's backyard. Upon hearing the story, the HBC man made light of it and shrugged it off. He finished his travels, and eventually the story made it's way into archival documents. ~ To some, the story is just pure entertainment, but for the villagers of that time, this was not a story. The HBC man may have made light of it, and shrugged it off in view of the story tellers at the time, but obviously held it in enough regard to add it into his journal though, which says a lot. Hope you enjoyed my commentary on the subject!